The Medium SPEED-VEST™ is designed for running, jumping and endurance training. Ideal for basketball, soccer, football, baseball and volleyball. 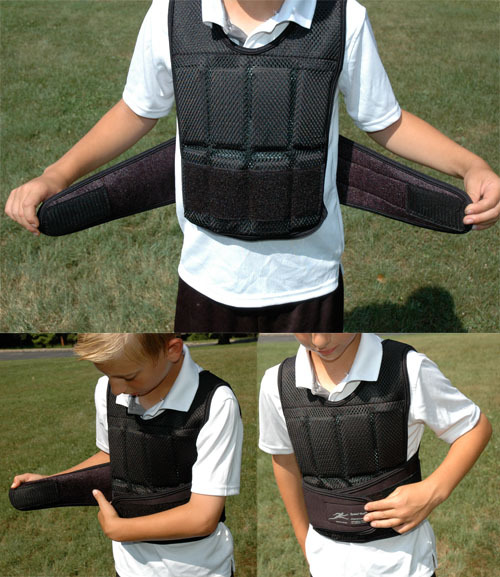 The Medium SPEED-VEST™ is the top of the line for youth medium to youth large athletic weighted training vests. The unique design of this patented vest combines IRONWEAR®’s soft Flex-metal® weights with a wide array of high performance features unmatched by any other weighted vest line. 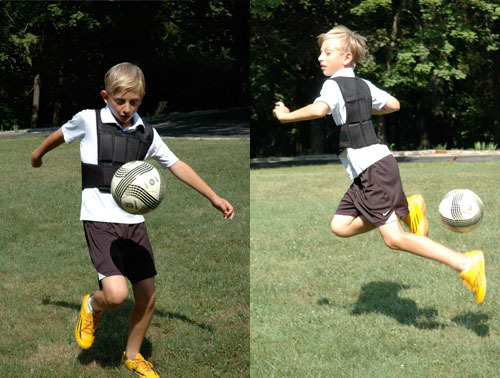 The Medium SPEED-VEST™ design is slightly smaller than the JR. SPEED-VEST™. The shoulders are slightly narrower and it fits a smaller torso. The vest is thin, flexible and comfortable. The proprietary oversized stretch strapping system holds the vest securely to almost any young athlete or small adult's torso, while the new double lock system on the belts keeps the vest completely stable during any exercise. The design allows the vest to expand to accommodate your breathing, even during rigorous exercise. The Medium SPEED-VEST™ incorporates a high porous polyester shell to allow air to flow freely through the vest. 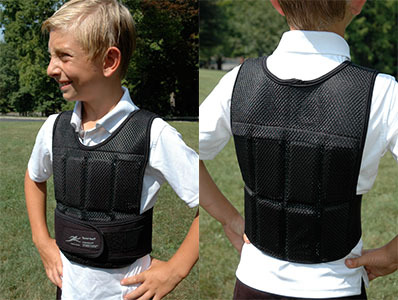 The Medium SPEED-VEST™ helps to keep the young athlete cooler so they can workout harder. The Medium SPEED-VEST™ stays in place better than any other weighted vest type. Every aspect has been designed to minimize movement of the weights. The Medium SPEED-VEST™ is designed to tightly hold one weight in each per pocket so that no movement occurs during rigorous exercise. 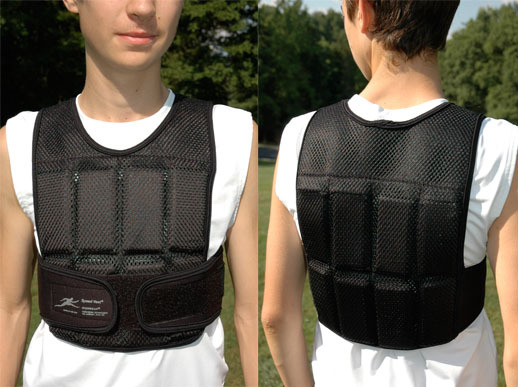 The Medium SPEED-VEST™ will not get in the athlete's way. With one layer of soft Flex-metal weights the vest is only a ½ inch thick. This combined with the unique thin flexible padded shoulder straps help to keep the Medium SPEED-VEST™ from inhibiting the athlete's movement in any direction. The Medium SPEED-VEST™ is easy to clean. Just hose it off, hand wash or machine wash vest with the weights removed. 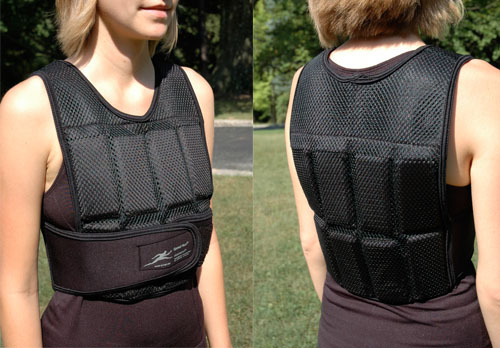 The Medium SPEED-VEST™ is supplied with 16 ½ pound Flex-metal® weights, but can be adjusted from 1 pound up to just under 9 pounds by removing or adding the ½ pound Flex-metal® weights. "I wanted to let you know we received the medium speed vest (2 days earlier than expected) and my son loves it. I was amazed at how heavy 8 lbs is. I'm glad I took your advice on which vest to go with. It fits him like a glove and we won't need any extra weight for a long time. From start to finish your customer service was tremendous. Thank you for everything. "I contacted the seller regarding additional weights for the vest I purchased. Not only did Arnie provide me with a response, he did something a bit more exceptional by asking a few probing questions regarding the height and weight of my son. After discussing this with him he actually suggested I go with a large unit vs. the one I purchased. All in all he provided superior service that not only met my needs but also exceeded them. He also threw in a few freebies unexpectedly (which I am grateful for). I will definitely do business with Ironwear Fitness again and I recommend to all this great company to do business with. I've used this product for a week now and the fit is comfortable for my son and I already see improvement in his training.